Over the past decade, the political ground beneath the Middle East has shifted. Arab nationalism the political orthodoxy for most of this century has lost its grip on the imagination and allegiance of a new generation. At the same time, Islam as an ideology has spread across the region, and "Islamists" bid to capture the center of politics. Most Western scholars and experts once hailed the redemptive power of Arabism. Arab Awakening and Islamic Revival is a critical assessment of the contradictions of Arab nationalism and Islamic fundamentalism, and the misrepresentation of both in the West. The first part of the book argues that Arab nationalism--the so-called Arab awakening--bore within it the seeds of its own failure. Arabism as an idea drew upon foreign sources and resources. Even as it claimed to liberate the Arabs from imperialism it deepened intellectual dependence upon the West's own romanticism and radicalism. Ultimately, Arab nationalism became a force of oppression rather than liberation, and a mirror image of the imperialism it defied. Kramer's essays together form the only chronological telling and the at fully documented postmortem of Arabism. The second part of the book examines the similar failings of Islamism, whose ideas are Islamic reworkings of Western ideological radicalism. Its effect has been to give new life to old rationales for oppression, authoritarianism, and sectarian division. 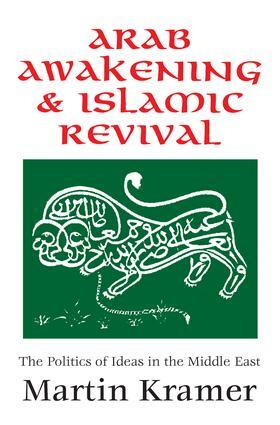 Arab Awakening and Islamic Revival provides an alternative view of a century of Middle Eastern history. As the region moves fitfully past ideology, Kramer's perspective is more compelling than at any time in the past-in Western academe no less than among many in the Middle. This book will be of interest to sociologists, political scientists, economists, and Middle East specialists. 9. "Islam is the Power of the Future"